"PEW" started during 1974 in a small workshop of Electric Motors and Pump sets. "PEW" has been a reputed manufacturer of a wide range of Quality Motors up to 280 frame. All motors are manufactured in Quality Assurance System Compliant with ISO 9001-2008. The motors comply with the regulation and standards consistent with IS & IEC standards. "PEW" offers wide range Squirrel Cage Induction Motors ranging from 0.125 kW to 125 kW in Three Phase.The range includes various types of motors such as Standard Induction Motors, Dual Speed Motors, Geared Motors, Brake Motors, Crane Duty Motors and a list of motors to name a few. "PEW" TESC cooling tower motors are specially designed flange mounted motors in totally enclosed construction to suit the air conditioning and refrigeration industries. They are made up of special long shaft construction with external threaded and to directly mount the fan blades. 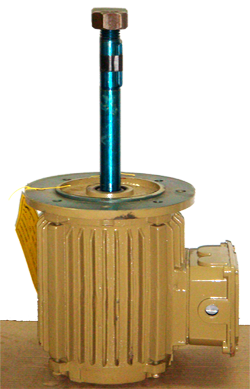 Motors are provided with Single / Double Shaft extension, Special shaft extensions like: a. Change in diameter and length. b. Taper shaft with threaded ends c. Any other Special shaft extension are available on request..
Motors are compact in design and light weight for easy maintenance. They are available in standard catalog design or as custom built. Flameproof cooling tower motors are also available.